It is glossy black with gold lettering that likely has real gold, as there is little or no tarnish after 130 years. Its logo is the most detailed of the varieties that have been on Eagle pencils. And whatever sharpened it left a nice scalloped pattern. London 1862, Paris 1867, and Phila(delphia) 1876 refer to international exhibitions at which Eagle pencils won awards. 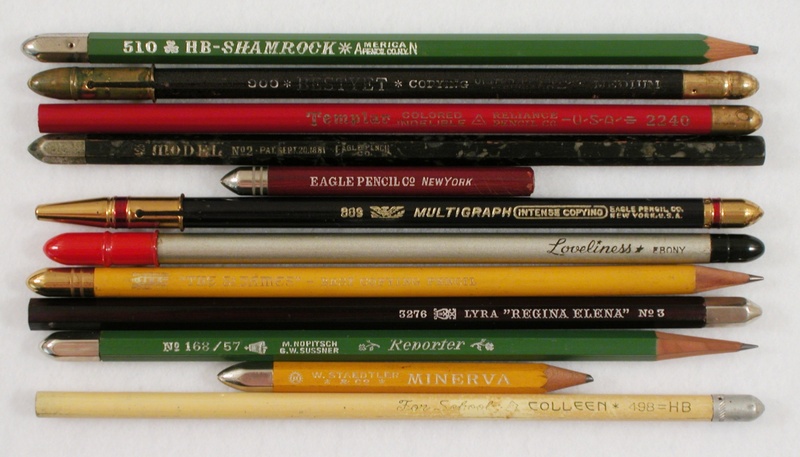 Here is a group of pencils that I describe as “Bullet Top.” Granted, some of the bullets are not very pointy. The Model has a patent date Sept. 20, 1881. A gem of a pencil.